The Marble Collegiate Church on the northwest corner of Fifth Avenue and 29th Street has a fence strewn with many long, brightly colored ribbons in front of a bronze statue of its famous late pastor, the Rev. Norman Vincent Peale, who was perhaps the nation’s most famous cleric as the church’s senior minister from 1932-1984 and the author of “The Power of Positive Thinking.” The ribbons are part of the church’s Peace Ribbon Project that was inaugurated in 2006. 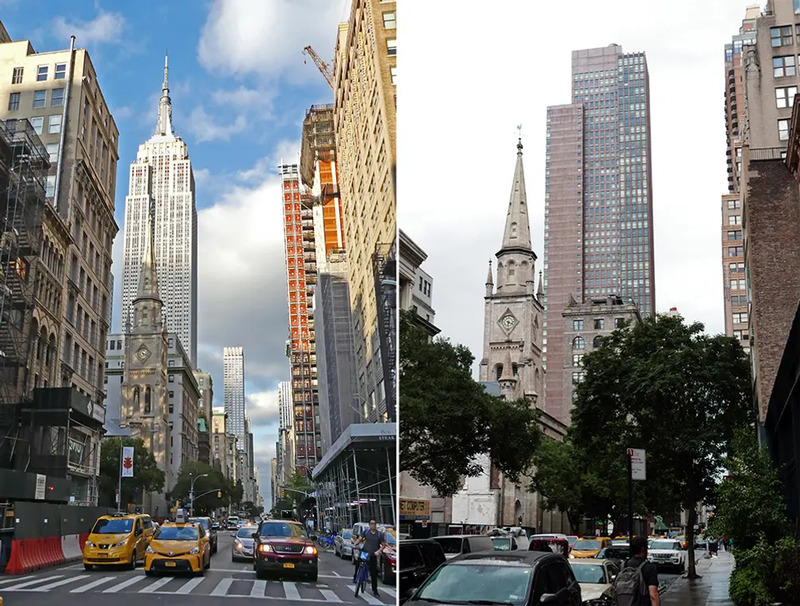 From the south, the church’s Romanesque Revival 1854 spire is an admirable foil to that of the majestic Empire State Building a few blocks to the north. 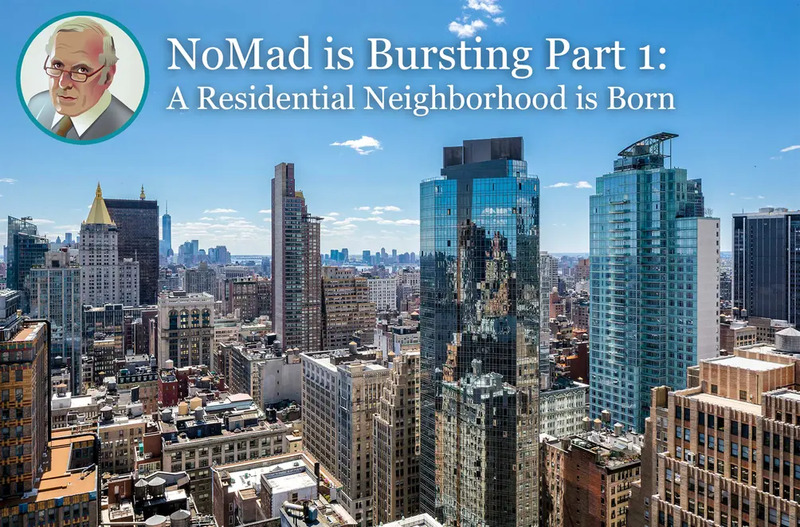 It is also the epicenter of an incredible building boom in NoMad, for decades a somewhat lackluster commercial district of spartan architectural distinction. This boom will not transform the area into the city’s next hottest neighborhood, but it is likely to surprise the socks off most pedestrians who have strayed away from the Billionaires’ Row of the Central Park South/57th Street corridor, the gargantuan peaks of the Lower Manhattan renaissance, the many delights of the High Line and the undeniable incongruity of the huge and literally far-fetched Hudson Yards projects. NoMad is the area of mid-Manhattan that is just to the north of Madison Square Park that was anchored for many decades by three major and classic New York landmarks, the Flatiron Building, designed by Daniel Burnham in 1903, the Metropolitan Life Clocktower Building, designed by Napoleon Le Brun in 1906, and the glorious Beaux-Arts Appellate Division Courthouse designed by James Brown Lord in 1900 with many fine statues on its roof and at its entrance. In the last century, the area matured slowly, adding a few very fine buildings such as the massive Metropolitan North Annex and Cass Gilbert’s gold pyramid-topped New York Life Insurance Building, but it became staid with the flourishing of the Toy Center, the Rudin’s bronze-glass Merchandise Mart at 41 Madison Avenue and Rose Associates’ large apartment building at 5 East 22nd Street across Broadway from the Flatiron Building did not enhance the area’s architectural nobility. Its prospects were also softened somewhat when the city decided to make Fifth Avenue a one-way street in the 1950s, a major traffic decision that would again offset the area’s gains recently with the creation of some less than attractive pedestrian plazas in the middle of Broadway on both sides of 23rd Street disrupting the traditional traffic patterns. These disparate developments did not result in a cohesive and homogenous neighborhood. The decline of the Garment Center and its flurry of push-racks of fashion combined with the unforgivable demolition of the fabulous Pennsylvania Railroad Station and the ragtag aesthetic of tertiary commercial buildings and an explosion of outer-borough bus traffic made Midtown South a rather non-descript mess between the glories of 42nd Street and Greenwich Village. A few years ago, the area’s prospects perked up considerably with the opening of Mario Batali’s Eataly food emporium on the first floor of 200 Fifth Avenue in the base of the former Toy Center. This became the unofficial culinary epicenter of the Flatiron District. 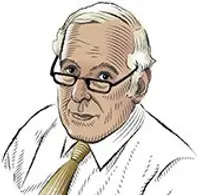 The redevelopment of Chelsea’s Flower District on Sixth Avenue in the 20s brought a lot of new residential towers of 30 stories or so that helped fuel the area’s appetite for restaurants, led notably by Danny Meyer’s very popular Shake Shack in Madison Square Park. 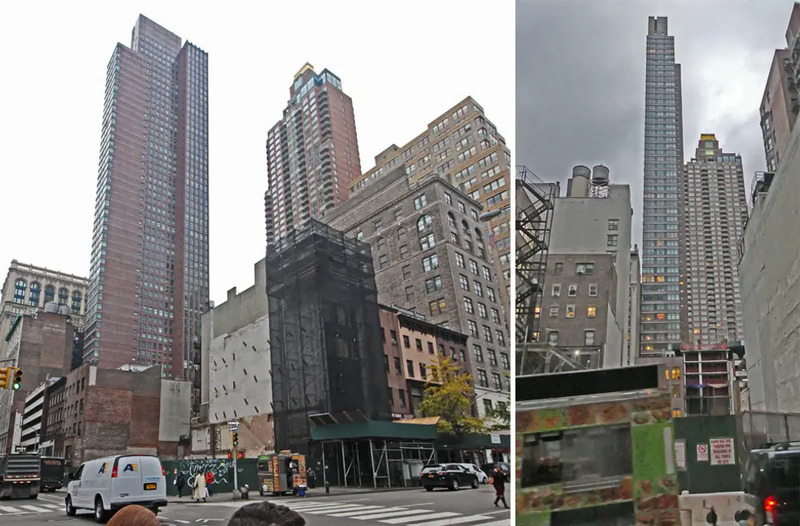 The three major high-rise developments that foreshadowed the neighborhood’s high-end prospects were the 48-story Madison Belvedere, now known as Instrata Nomad, designed in 1999 by SLCE at 10 West 29th Street and the 55-story Sky House at 11 East 29th Street designed in 2008 by FXFowle. Both were attractive, sedate and comely, red-brick towers of about 50 stories each on the south and east sides of the charming Little Church Around the Corner. In 2013, Victor Homes opened 241 FIFTH, a 76-unit residential condominium project designed by Eran Chan while he was at Perkins Eastman Architects. 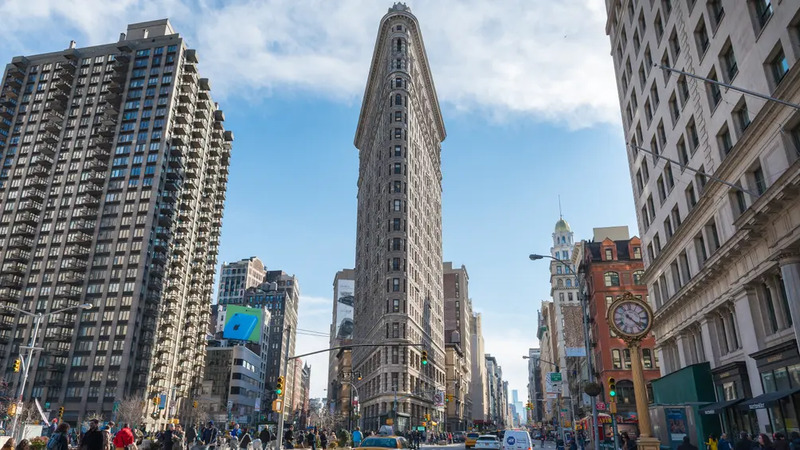 The building is just north of the Grand Madison and the Whitman, two conversions of prewar buildings that overlook the north side of Madison Square Park. In 2006, 325 Fifth Avenue was erected. It is a pale-green tower with a curved roof element that was distinctive but not contextual. It was designed by Stephen B. Jacobs Group, who would also design in 2010 the peppy, 19-story Gansevoort Park Hotel at 420 Park Avenue South with glowing colors like his Gansevoort Hotel in the Meatpacking District. 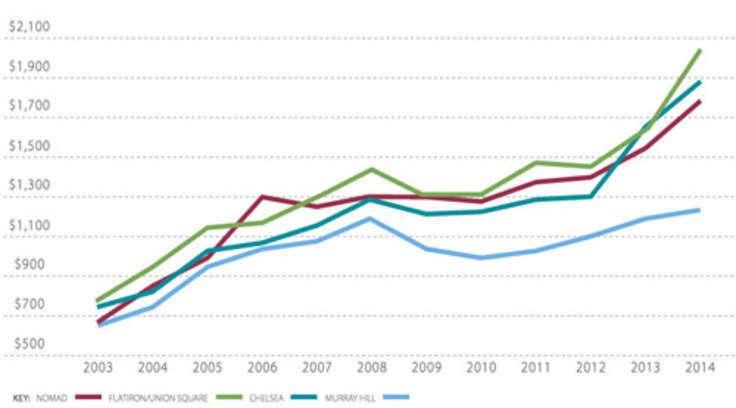 Late arrivals to the mid-2000s real estate boom unloaded hundreds of apartments into a tepid market. 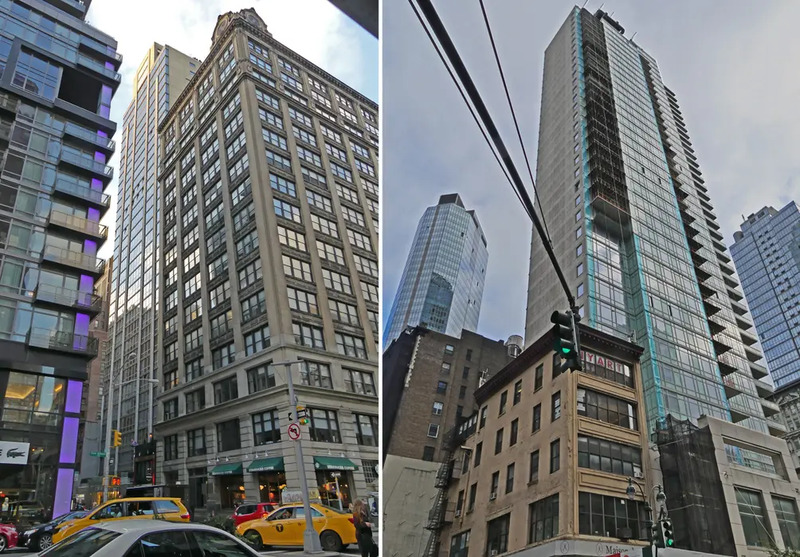 Twenty9th Park Madison by H. Thomas O'Hara brought 132 condos to NoMad and a dark glass 50-story tower known now as One Madison Park at 23rd Street sat empty for several years due to a fallout of its developers. One Madison Park was designed by Cetra/Ruddy Architects and is not contextual with its landmark neighbors, but its 7-unequal, white, stacked boxes on its north and east faces is an intriguing but not masterful form, even attracting Rupert Murdoch to purchase a triplex penthouse in 2014 from the developers who opened the building, the Related Cos. and HFZ Capital Group. The two tall towers at 400 Fifth Avenue and 425 Fifth Avenue are north of NoMad’s traditional northern boundary (NoNoMad perhaps? ), but are “too big to…” ignore. 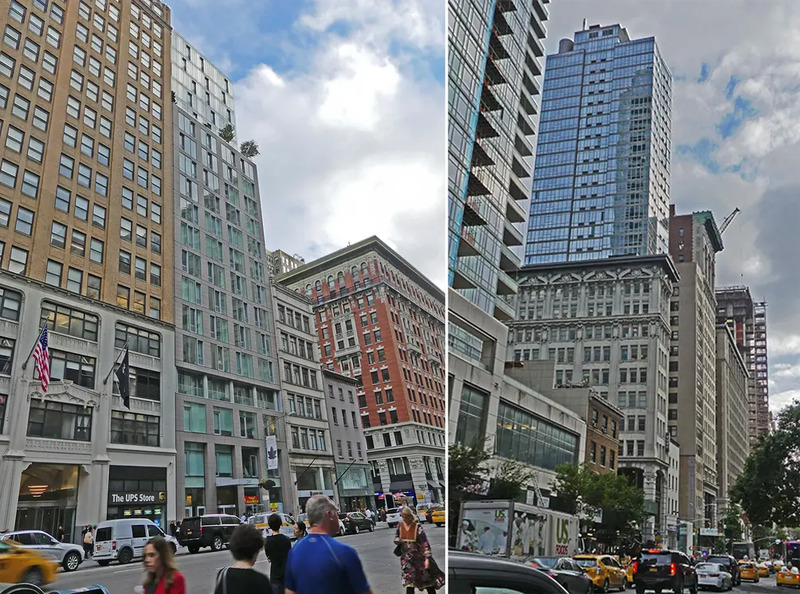 The 60-story mixed-use tower at 400 Fifth Avenue sits on the northwest corner at 36th Street. It is distinguished by its vertically angled fenestration and flared crenelated top designed in 2010 by Gwathmey Siegel & Associates for Bizzi & Partners Development. 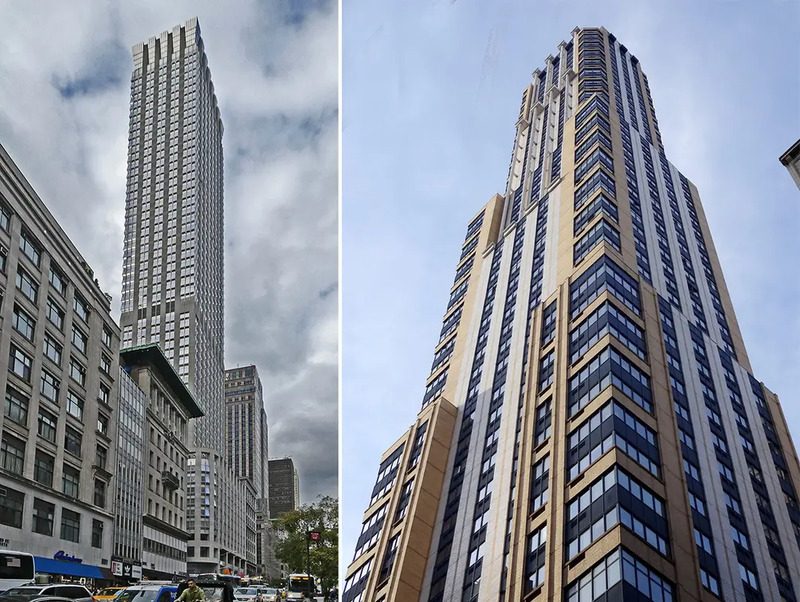 Nearby, across Fifth at 38th Street, is the rather garish yellow residential skyscraper at 425 Fifth Avenue designed in 2003 by Michael Graves. 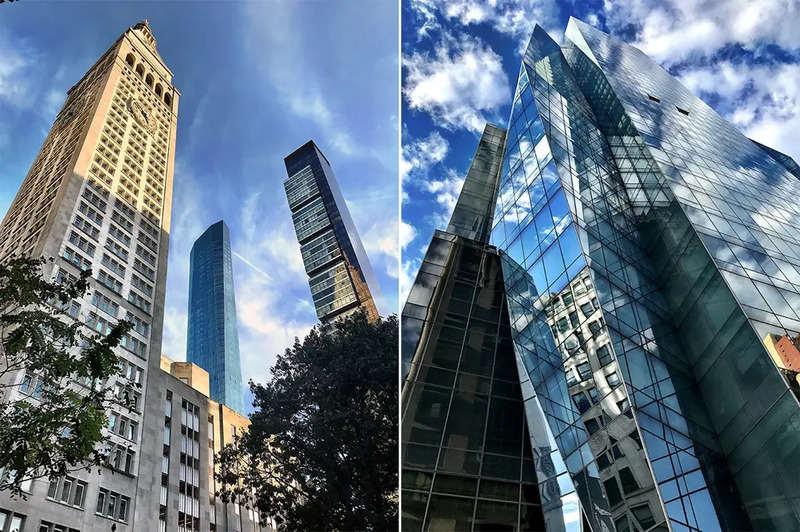 In contrast to the Postmodern towers above, is 400 Park Avenue South and Prism, which is perhaps the best looking new development in the neighborhood. The pyramidal green-glass rental and condo tower anchors the southwest corner of 28th Street. It was designed by Christian de Portzamparc, the architect of One57, which was the first of the supertalls along Billionaires’ Row. 400 PAS’ bottom 22 floors of the bold shard of a tower contains 269 rental apartments developed by Equity Residential and the top 18 floors have 81 condo apartments developed by Toll Brothers City Living. The rental entrance is at 50 East 28th Street. The condo entrance is on Park Avenue South. The latter, unfortunately, contrasts badly with the rest of the blue-green tower because it is white. A & R Kalimian Realty were the building’s original developers and commissioned de Portzamparc. Ungainly and confusing, nonetheless it is extremely dramatic and modern. These high-rise sentinels, as notable as they are, are only a small taste of what's to come and will join a crowd of taller, more daring towers. Stay tuned for Part 2.